Tea drinking originated in China and it is the legendary Emperor, scholar and herbalist Shen Nong who is credited with its discovery. Shen Nong (known as the Divine Farmer) was said to have lived four and a half thousand years ago. He is known as the father of Chinese herbal medicine as well as of agriculture (inventing the plough and the rake, and sowing the five grains). Renowned for his courage in the pursuit of medical knowledge, he is said to have etasted hundreds of different herbs. According to legend, Shen Nong always boiled his water before drinking it, and it was when leaves from a wild tea bush fell into the simmering pot that he discovered the delights and virtues of tea. He subsequently drank tea to counter any poisons in the herbs he was testing, although he is said to have finally died of a toxic overdose. Another popular story ascribes the discovery of tea to the Buddhist monk Bodhidharma who is said to have fallen asleep during his seventh year of continuous meditation. He was so angry with this lapse that he cut off his eyelids and where they fell to the ground the stimulating, sleep-countering tea bush sprang up. Bodhidharma, however, is a real historical figure who is credited with helping to bring Buddhism from India to China in the fifth or sixth centuries CE, and tea consumption in China reliably predates this by several hundred years. The link between tea and Buddhism is a valid one, nevertheless, since both thrive in hills and mountains and Buddhist monks became so skilled at growing tea that its sale underpinned the economy of many of their temples. Tea's earliest use appears to have been as a medicine, with records suggesting its consumption as far back as the Zhou dynasty (first millenium BCE). By the time of the Tang dynasty (618-906 AD), however, tea was widely drunk for pleasure, indeed by then it had become the national drink of China and is listed among the 'seven necessities' of Chinese life (along with firewood, rice, oil, salt, soy sauce and vinegar). It was during the Tang that Lu Yu, known as the Sage of Tea and perhaps the only person in history to run away from a Buddhist monastery to join a circus, wrote the Tea Classic (Cha Jing). This - the most famous book on tea ever written - describes the history of tea, the tools needed to harvest and prepare it, the twenty-eight utensils required to brew it, the different kinds of water to make it with, and of course how to drink it - with an emphasis on mental preparation and the cultivation of tranquility. From Lu Yu’s time, tea drinking has been practised as an art form and a kind of active meditation. Such was the influence of Lu Yu that merchants had images of him inscribed on their kilns and worshipped him as the patron deity of tea". In the early days of tea drinking in China - during the Han dynasty (206 - 220 CE) - whole tea leaves were infused to make a medicinal brew, but by Lu Yu’s time it was being prepared by steaming, drying and compressing into easily-transportable cakes - to be crushed and powdered for tea making and often mixed with ingredients such as onions, salt and ginger peel. It was not until the Ming dynasty (1368 - 1644 CE) that the fashion for loose leaf tea returned, which led to the great flowering of teapot and teaware design. Tea-drinking had long spread from China to neighbouring countries such as Mongolia and Japan. The 18th century History of the Ming (dynasty) wrote of such 'barbarians' (i.e. non Han-Chinese), " … if they cannot obtain tea they fall ill. Therefore since Tang and Song [7th to 13th centuries CE] times we have traded tea for horses and so kept them under control." It was not until 1606, however, that the first European tea shipment arrived in Amsterdam. Despite a price that initially confined its consumption to the wealthy, tea drinking slowly spread through Europe over the next two hundred years, finding a particularly warm welcome in Britain and Russia. Because its expansion into Europe coincided with the late Ming dynasty transition to whole leaf tea brewed in teapots, this was the style that was adopted, and since black tea keeps and travels better than green tea, it was black tea that rapidly came to predominate. During the early nineteenth century the first British tea plantations were established in Assam in India with the aim of breaking China's monopoly. Seeds were initially brought from China but this was soon followed by the discovery of native Indian tea plants. These were a variation of China's Camellia sinensis sinensis and were classified as Camellia sinensis assamica. This native plant was better suited to the hot conditions of Assam, while the Chinese variety thrived in cooler mountainous regions such as Darjeeling. The success of this project improved ease of access to tea and reduced its price, resulting in the massive uptake of consumption in Britain and its colonies. The spread of tea drinking contributed to improved public health (because water that was frequently contaminated had to be boiled to make it), to greater temperance (because previously beer was the only reliably safe drink) and to technological advances in shipping as superfast tea clippers were developed to speed tea to its destination. 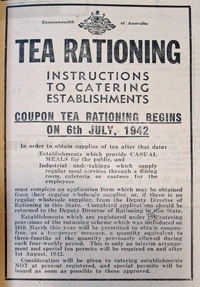 The esteem in which tea was held by the British and its vital role in the country's morale was reflected in the government taking control of tea supplies during the first and second world wars.